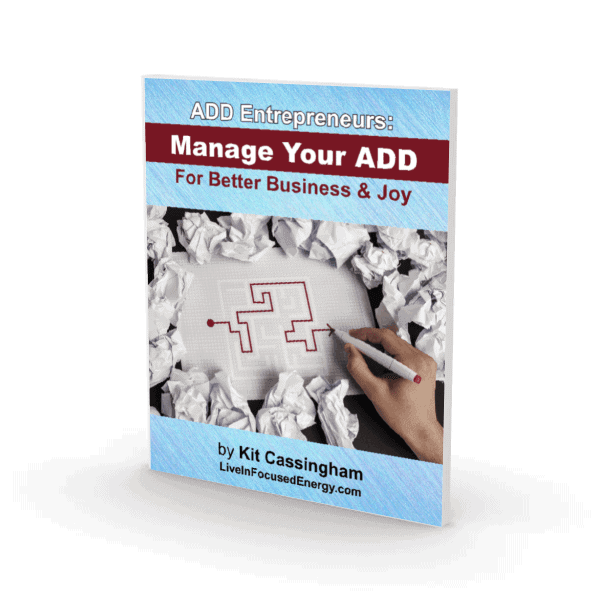 Kit’s book, ADD Entrepreneurs: Manage Your ADD For Better Business & Joy, helps you manage your ADD with 12 strategies to get unstuck to help you thrive in business. Download immediately and read right from your screen, or print it out if you prefer (68 pages). See below for complete description. How to focus, balance and simplify your work life. Overcome shame and denial over ADD. Recognize your demons — the victim attitude that reduces your success. Build a platform of self-confidence. Develop or sharpen your clarity to build a platform of high performance. Understand your work load for more effectiveness. Learn structure and time management to create the framework for a productive life. Self care to support your health and energy. Making sure you’re on the right career path. The importance of service in your life. Lots of ideas I had never thought of before — definitely helps me focus! This is a densely-packed book of information and suggestions on how to better manage my work life. I’m not sure I have ADD, but the book has proven to be invaluable to me to get my work life back under control. I like the attitude and suggestions Kit has about overcoming shame — something anyone can suffer — to get more out of life and have more to give to life. There is so much information in this book! Whole trains of thought and helpful, realistic, practical suggestions you can make use of right from the start. I do have ADD and I love Kit’s positive approach to seeing it as a strength in your life rather than an affliction. I didn’t discover that I’m ADD until I was in my 60s and had spent my life wondering why I wasn’t like other people and couldn’t seem to manage life as others did. What a relief to find this book that enables me to see my differences as all plusses in my life and to make use of those to make my next years my BEST years! Thank you Kit! !